CHRISTMAS LIGHTS are twinkling over the Great British High Street, and thoughts are turning to festive fun. Yes, ’tis the season to be jolly – but it’s also the perfect time to take a cruise, as my family and I discovered last year. 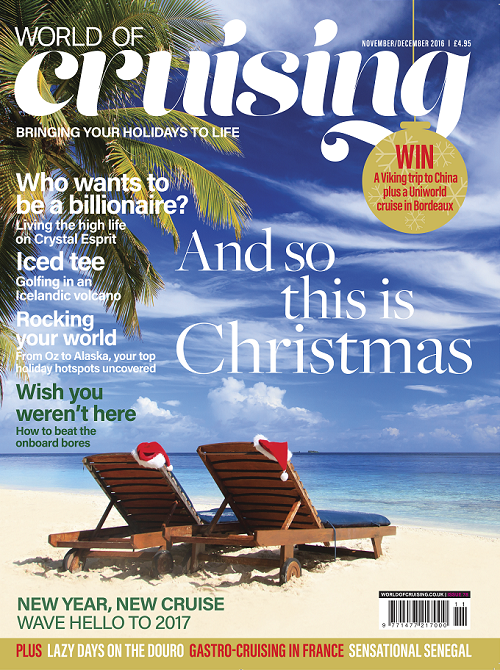 If you like the sound of our Caribbean Christmas (page 37), it’s not too late to run away to sea and become an Xmas exile yourself (can you think of a more perfect present?). Or how about celebrating Christmas by your fireside, followed by a New Year knees-up somewhere exotic? See inside for our top ten Hogmanay holidays. How do you fancy golfing in an Icelandic volcano (page 28)? It’ll certainly give you a story to silence the dreaded Cruise Bores (we’ve all met them, but see page 88 and you’ll never have to suffer in silence again). Elsewhere in this issue you’ll find gastro-cruising in deepest France, days out in Doha, and some touching memories of days at sea with Sir Winston Churchill from his granddaughter Celia Sandys. Finally, much as we love cruising it has never been at the cutting edge of fashion. That’s one of life’s eternal mysteries, so we sent one of Britain’s top style bloggers out to sea. Did we convert her? Turn to page 58 to find out. I hope we’ve given you some interesting ideas – but whatever you do and wherever you go this holiday season, all of us at World of Cruising would like to wish you a very happy Christmas and a globe-trotting new year.